question_answer1) Compare the number of birds on tree 1 and tree 2.
question_answer3) Tanishq buys two items for Rs. 34. What are the two items? question_answer4) Which cup of ice cream is placed in the second position from right? question_answer5) Which has the least capacity? 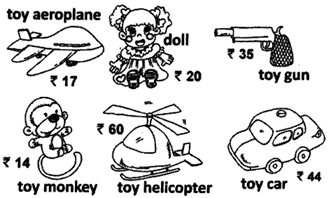 question_answer6) Eesha has 9 stickers. Bindu has 6 stickers. How many fewer stickers than Eesha does Bindu have? question_answer7) Which number should come in the place of in the following? question_answer8) In the given calendar 21st day falls on ______. question_answer9) What is the shape of the shaded part in the figure? question_answer10) Which two children collect exactly 18 balloons? question_answer11) Which lid for the teapot makes 8? question_answer13) Which amount is more than Rs. 50? question_answer14) Identify the car which is different from others. 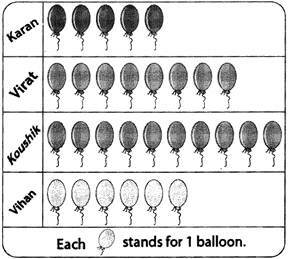 question_answer15) Anil had 12 balloons. If 4 balloons were burst, then how many balloons are left with him? question_answer16) Sanju has Rs. 69. After buying a pair of shoes, he has Rs. 26 left. How much does the pair of shoes cost? question_answer17) Which parcel is the lightest? question_answer18) Venu is in a queue. He is 3rd from the front and 6th from behind. 2 people left the queue. How many people are there in the queue now? question_answer19) Part of a triangle is cut off as shown in the figure. Identify the missing part of the triangle. question_answer20) Which time is called mid-night?